Every photographer knows that there are three pillars of photography: Aperture, Shutter Speed, and finally the ISO. It’s important to note that you are more likely to understand ISO better if you already understand aperture and shutter speed. If you’re old enough, or adventurous enough, to have shot using film then you know the importance of ISO and its consequences on your outcomes. Today’s digital photography allows you to change the ISO while shooting without having to change film. Life is so much easier! So what is ISO and why is it so important? We’ll break it down for you below. Simply stated, ISO is your camera’s level of light sensitivity. On a digital camera, you will need to set the ISO manually. If you were using film to take pictures, you would need to select the ISO by choosing the right ISO film. As you lower the ISO number, you reduce the sensitivity to light. A higher ISO number means the most sensitive the camera is to light. Keep in mind that camera manufacturers set their Base ISO. Shooting on that Base ISO will give you the best quality picture. For example, a Canon and a Nikon won't have the same Base ISO, so it’s good to check your camera’s manual for its Base ISO if you don’t know it. 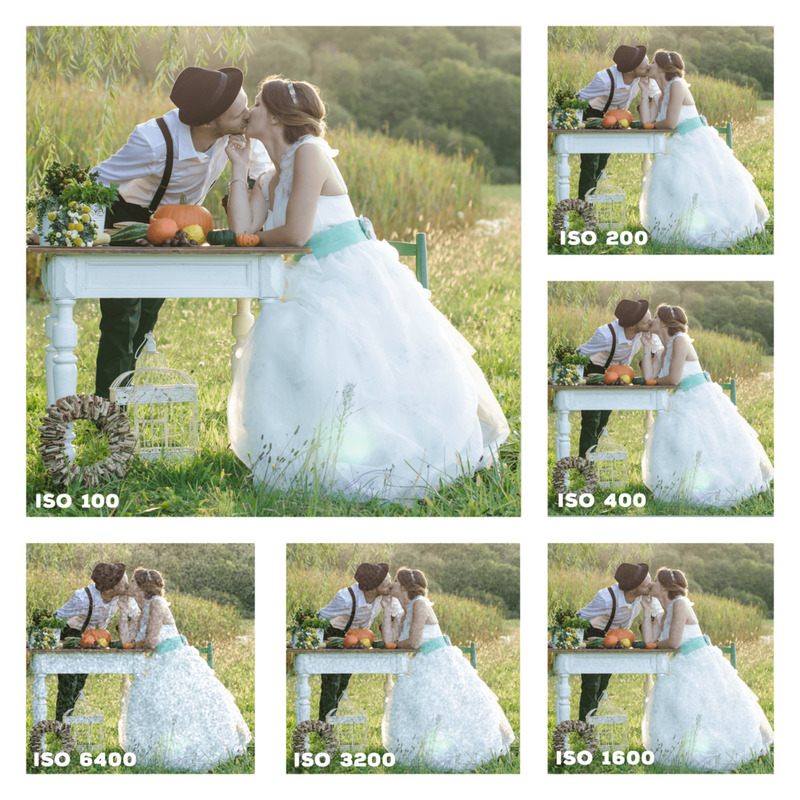 Think of the Base ISO as the lowest ISO number on which you could for the best quality picture. ISO numbers start at 100 or 200 as a base and increase from there times two: 100, 200, 400, 800, 1600, 3200, etc. Each time you change between numbers you affect the sensitivity to light. A 400 setting is twice as sensitive to light as a 200. A 3200 ISO is 32 times more sensitive than a 100, and it means that it needs 32 times less time to shoot an image. The higher the sensitivity, however, the more noise a picture will have. A side note: There is an image sensor built into each camera which is the part that adjusts the sensitivity to light (ISO), gathers light, and transforms it into a picture. The sensor is what allows photographers to shoot under low-lighting conditions. Not only is this your camera’s most important component, but it’s also typically the most expensive part of your camera! There are several reasons speed (ISO) matters to a photographer. Light is one reason. The other is freezing motion or action. The faster the ISO, the faster it captures the image allowing you to stop motion. It can get a little tricky knowing how to play around with ISO for stop-motion, but practice will always help. If you set ISO so that it’s slower than the motion you are trying to shoot, you will get blurring. And, unless that’s the effect you are going for, you’ve just ruined the picture. For most pictures, you should try and shoot only on your camera’s Base ISO, and that’s likely to be either 100 or 200. If you start straying from that, you will be sacrificing quality and detail in your image. So can you use a low ISO in dimmer lighting? Yes, you can use a lower ISO in dim light but with some caveats, of course. You should use a tripod or stabilize your camera on a firm surface. Even so, if you shoot on a lower ISO in dimmer light and there’s any movement, it will appear blurred or transparent. It can be a terrific way to capture special effects! There are several good reasons to shoot in higher ISO: shooting inside without a flash to capture the shot without worrying about blur, quick shots where the camera might not have enough light to quickly capture the picture or a moving object like an animal. Some of the newer DSLR cameras have an auto setting for ISO which can help tremendously in darker conditions. The Auto ISO allows you to set the maximum number you want for ISO, and the camera will auto select but without going over that number you set. By manually setting maximum ISO number, it allows the photographer to limit the noise in the shot. We hope you feel ready to play around with the ISO with aperture and shutter speed for some better quality, customized photos. Shooting on auto is easy and can be great, but it standardizes your photographs in ways you might not want. Once you understand the three pillars of photography, you are well on your way to great photography! What is exposure compensation and how do you use it for better pictures?